Yes, I’m the girl who is constantly trying live better but fails. Why did I fail so many times? The reason isn’t rocket science actually. I haven’t been listening to myself since I gave birth to my daughter in 1995. It’s always been about everyone else. It is a great hurdle to acknowledge this but even a greater hurdle to change it. Much of those who I do things for are in the resistance stage; not wanting to do their own laundry or REALLY fend for themselves on “fend for yourself night”. They know that if they don’t do it, I will. This year is the year where I am putting myself into action. I have read the book Wheat Belly as I have been experiencing huge digestive issues over the past 6 months. I will also use my infrared sauna every day as I know the health benefits that it can bring. The most important thing that I can do at this time is walk. 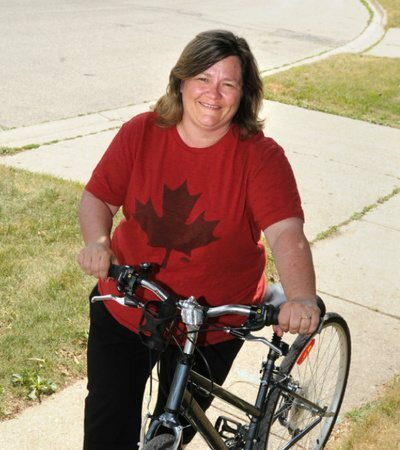 Last year, I trained at World Gym in Cambridge, Ontario to prepare for the Ride for Heart. I realized that what I was doing was hurting me more than helping me. Being the stubborn person that I am, I kept going because I was determined to conquer my goal. In fact, I switched trainers because I felt I wasn’t preparing “good enough”. Big mistake because this girl knew what was required for a woman my size. As a result of this, I now have Coccydynia which immediately started after my 25 km victory. This year, I want to take things slow, make better choices, and not fret that I’m not seeing a 5 pound loss a week, but a gain in my overall health and well being. I can’t tell you how much the Infrared sauna has assisted with my husband’s Crohn’s Disease. Research shows that infrared Saunas can assist and improve many ailments that the common person experiences such as stress, arthritis, muscular, and skin. The neat thing about infrared saunas is that they can fit anywhere in your home. For example, my 2-person sauna is in my bedroom. It’s our little oasis before bedtime. Great Saunas has teamed up with eight Great North American Bloggers to giveaway an infrared sauna (retail value $2,400) to one lucky reader. Fill out the entry form below to qualify. Entrants must be 21 years of age or older and a resident of USA or Canada (Contest is not available to Quebec Residents). Please review the Terms and Conditions prior to entry. Submission will indicate that you agree to all terms stated. Previous Previous post: We Learn From Each Other.